If you make a search in your browser for “What are the reasons to optimize images?” or “What are the top image optimizer Mac solutions?” as well as “What kind of optimize images Wordpress plugins to use while uploading your content to the web site?” and many more, you will find hundreds of thousands of different articles with a lot of information and there is no wonder that you can easily lose your mind due to such a flow of details and info. In our article, we will try to make the difficult things simple and provide you with the quickest solution on how to compress files on Mac. First of all, let’s figure out what does it mean to optimize a photo? Well, briefly, it means making it easier or less heavy, that is, to make it take a minimum of a disk space (kilobytes or megabytes) and quickly download to the site. In other words, optimization of the photo is when visitors come to your site or blog do not need to wait for the pictures, photos to appear and they quickly received the desired images. Of course, someone can say that today almost all of the users and almost everywhere there is the high-speed Internet. And in most cases, it is the truth, but let’s do not forget that a lot of people today surf the Internet with the help of some mobile devices, where the download speed of the Internet pages leave a lot to be desired and very large pictures may only turn up the heat. So as you understood, the size of the photos on the site affects the weight and the speed of the loading pages. A very long site load can cause an impatient user to leave the resource. Search engines, for instance, Google or Yandex take this fact into account when ranking. Therefore, you should think about optimizing images, if you have not given it the due attention before. However, not only these factors play an important role. For your convenience, we have gathered below the main reasons why to compress photo on Mac as well as on other platforms. Once again we will say that the speed of the downloading page plays an important role in this issue. That is why it is highly recommended to make the right preparation for the image prepare the right that will positively affect the speed of the page loading. Just admit that you do not like it when it takes the eternity for the graphics to be loaded on the site. And now imagine that the informative value of an article depends on the pictures in it. For example, information about the different breeds of horses. Without illustrations, such an article becomes practically useless. And if these illustrations are loading for a long time, then the user will lose their patience sooner or later and will just close your site. Also, you should not forget that image optimization is useful for SEO. Wondering how? It is all because people will be able to find your site while searching for images. Take for example the same article about breeds of horses: if all the pictures of horses are properly signed, they can appear in the search engine results thus bring you additional traffic. Another very important criterion is the size of the photos on your site. If the picture is used only as a decoration, there is no need to upload it in a large size. However, the images that contain useful information for the user, should be downloaded in a size that makes it easy to get acquainted with their content. First of all, this concerns infographics and other pictures with text, as well as photographs of goods in online stores. All small parts must be visible. One can say that the high quality of photos is good. However, on the Internet, there is a slightly different rule, namely, the optimal ratio of image quality and file weight. There are a large number of image optimizer Mac solutions that can reduce the weight of the image by 50-70% without noticeable loss of quality. Of course, in the process of such optimization, the photo definitely loses something, just, for instance, the saturation of some colors decreases, but all this is done in such a way that the human eye almost does not see any changes. The picture remains the same clear and well presented, but it weighs, say, no longer 400 KB, but 90 KB. Just remember the following rule, the more photos are there on one page, the more attention you need to pay to their weight, that is why it is rather important to know how to compress a picture. Also, some sites accept only certain types of image formats or image size. That is why it is obvious that one day you may need to upload a photo of a certain format, for example in .png, so here to the rescue can come again PNG optimizer Mac solution. JPEG (files with the extension .jpg, .jpeg). It is a rather popular raster image format, the algorithm of which, unfortunately, compresses the picture with the loss of quality. However, if you want to know how to compress a JPEG on Mac without losing the quality, you will find the answer to this question below. As you see, JPEG is suitable for photos and colorful pictures with smooth transitions of colors, on the other hand, it is not suitable for drawings, screenshots, images with text and the sharp contrast between colors. 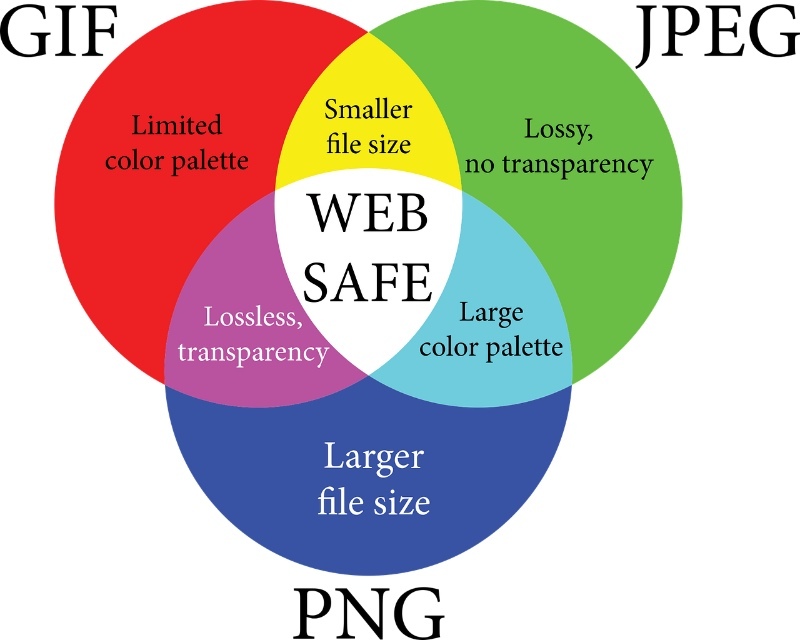 PNG (files with extension .png).This format also refers to raster format but unlike JPEG, its algorithm allows you to compress the image without losing the quality of the photo. So in case, if you need to save a picture with printed text or another image in which you need clarity, select the .png extension. Also, the format supports transparency, including partial transparency. GIF (files with .gif extension). This format can also store compressed data without losing the quality, but it supports only 256 colors, so as you understood, GIF is not suitable for storing full-color photos. On the Internet, this format is most often used for animation, pictures with few colors and images with fully transparent pixels (for example, a transparent background). So how to compress files without losing the quality? The answer is very simple – you need to use one of the tools that would allow you to compress images in the following formats (JPEG, PNG, GIF) without the loss of quality. Besides everything written above, we shouldn’t forget about the incorrect proportions of the image, that can corrupt the image. So before the layout, it is highly recommended to prepare all the parts of the site in a decent way, especially pictures in the format .png and .jpg, otherwise, the layout will be impossible, if violating some of the advices. So, as it turned out, optimization of a photo is one of the most important factors that should be taken into consideration. Unfortunately, users often forget or simply do not know that the pictures also need optimization. And it's not just about website promotion. Well, what to do? How to compress an image? As you have already guessed, you need to find a decent optimize app. Due to the great variety of such apps, it can be sometimes very problematic to find the one that is easy to use, straightforward and can fully satisfy your requirements. One of the most powerful editing apps nowadays is, of course, Adobe Photoshop that offers a great set of features and opportunities. However, in order to understand all of its possibilities, it can take you a long time. Despite being a great app, it is rather difficult and users often search for an easier solution. So if you want to know how to compress an image as easy as it can be and even more in bulk you have come to the right place. In order to ease your mundane work, the feature of a bulk processing of the photos can be a great plus. Bulk image editors have already saved a lot of time for a lot of users and there is no wonder why users are searching for such kind of solutions. 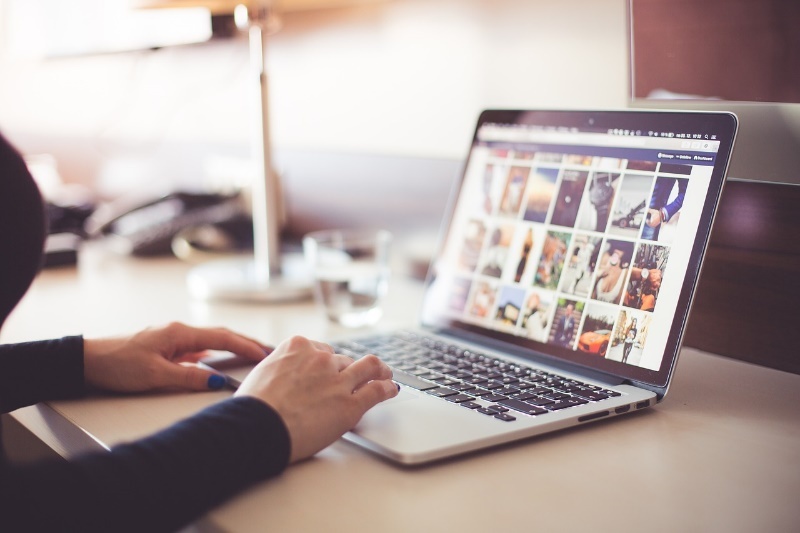 As for PhotoBulk, the software has also has proved itself as a powerful bulk solution that is why in our article we have decided to review the feature of a bulk image optimization with the help of this image optimizer Mac solution presented by Eltima Software. The interface of the app is done in a minimalistic way and rather straightforward, there are no excessive details that can make PhotoBulk a good choice for a perfectionist, as well as for users with different skill levels. As we are talking here about optimization, then it should be noticed that the app uses smart lossy compression techniques in order to reduce the size of the file that doesn’t deteriorate the image, so you can stop worrying that while optimizing your images you may lose the quality. Besides that, when processing photos, PhotoBulk does not deteriorate the originals of the photo, so there is no need to panic thinking that you will lose them forever. All the originals remain intact. ★ or from the Mac App Store. Once everything is downloaded and installed, you need to launch the app. Prepare the images you want to optimize and move then to the PhotoBulk’s window for editing by drag-and-dropping them. However, if you are a fan of using hotkeys or got used to doing everything in an old school way by choosing File → Open… from the menu bar, you can choose any other variant available in the app. All the selected photos are displayed in a filmstrip at the bottom of the app. You can easily choose any photo from the filmstrip in order to check the editing. 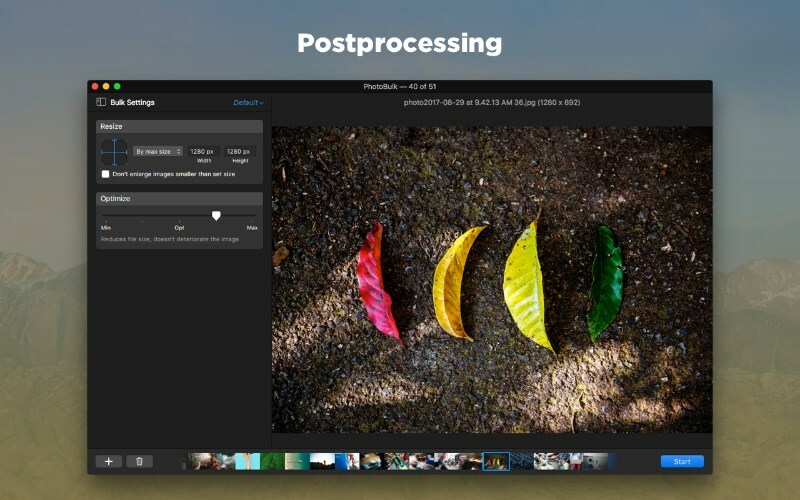 In order to start optimizing photos, make sure that the “Optimize” option is activated in the sidebar in the menu “Postprocessing”. Please note, that the current version of the app allows optimizing JPEG and PNG files only. ★ if moved to the right you will have maximal compression. If you are fully satisfied with the settings and are ready to apply them, hit the “Start” button. In the invoked window you will be asked to specify the path for the processed images to be saved. The last thing that is left is to hit the “Save” button and wait. And that is it. Rather fast and easy. In addition, PhotoBulk can help you with watermarking, resizing, renaming your favorite photos at a time. 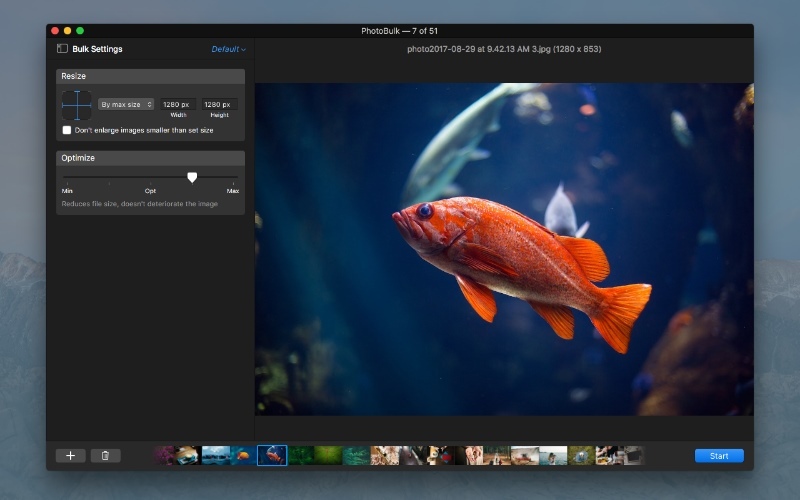 With PhotoBulk you can dramatically easy compress photo on Mac and not only. Try it yourself.